This year’s big game is February 7 at Levi’s Stadium in Santa Clara, California. With the current drought in California, the city of Santa Clara faced the challenge of sustainably watering the field and operating the restrooms in Levi’s Stadium for the Super Bowl. After developing and installing a new water pump system, up to 85% of water used in the stadium is now recycled water. The drought is not just a problem for the stadium, it’s a problem for everyone. 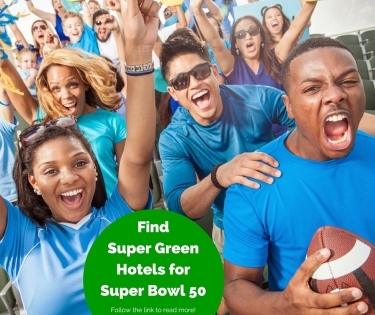 These California hotels are doing their part to conserve our natural resources, even during Super Bowl season. If you’re traveling to the Santa Clara area, be sure to book your stay at one of these hotels. The Palace Hotel was established in 1875 as San Francisco’s first luxury hotel. In 2015, the hotel was renovated with sustainability in mind. The hotel purchases renewable energy certificates to match 100% of the electricity it uses. With the Make A Green Choice program, guests can choose to decline housekeeping services by placing a card on their pillow. For each day they decline, they will earn points toward a future stay at any Starwood hotel. One night with the Make A Green Choice program can save 49.2 gallons of water and .19 kWh of electricity. While Avatar Hotel is geared toward the tech-savvy people of Silicon Valley, you don’t have to be a nerd to enjoy its sustainable amenities. Guests can choose recycled pens and paper, reusable memory sticks and soy-based inks for their meeting supplies. The hotel has local, organic snacks, and guests don’t have to feel guilty if they order too much because Avatar Hotel has a food donation program. The hotel uses ENERGY STAR appliances and has low-flow showerheads and faucets to conserve water. If you’re looking for a cozy bed and breakfast, the Madison Street Inn is for you. This inn takes water conservation seriously with low-flow faucets, toilets and shower heads installed throughout the inn. The flowers and herbs have drip irrigation, and the yard even has artificial grass. Employees compost produce scraps, coffee grounds and egg shells every day, then use the compost as fertilizer for the garden. The washer and drier units are energy efficient, but they use a clothesline outside on warm days to save even more energy. Serrano Hotel is certified as a GreenLeader Platinum, the highest certification level for participation in environmentally friendly activities. In order to achieve that certification, Serrano Hotel created a linen and towel reuse plan, tracked energy usage regularly, installed energy efficient light bulbs and educated staff and guests on green practices. The hotel exceeded the minimum requirements set by TripAdvisor by 60%, giving it platinum status. The Dolce Hayes Mansion created a Green Team to monitor and maintain its environmental practices. The team researches and coordinates involvement in local environmental projects and programs. The team created partnerships with Oak Grove High School, the city of San Jose and Pacific Gas & Electric. The Dolce Hayes Mansion uses organic, local foods along with biodegradable to-go containers. For transportation, employees are eligible for a free ECO Pass, and there is a no idling policy for the hotel property. Parc 55 is in downtown San Francisco, on the corner of Market and 5th. The hotel uses has a variety of green initiatives including using energy-efficient laundry machines, and then donating retired linens and amenities to local charities. Parc 55 also recycles all food waste from its three dining venues through composting and uses processed cooking oil for alternative fuel. This Hilton hotel is even pet friendly and is close to dog parks, so you can bring your furry friend. Guestrooms at the Hotel Shattuck Plaza in Berkeley have energy-efficient lighting and HVAC units and low-flow toilets. This hotel’s goal is to reduce its impact on the world and only work with vendors who adhere to that philosophy. Hotel Shattuck Plaza has a Bay Area Green Business Certification, and intends to maintain that status by recycling more, conserving natural resources and minimizing pollution. 5 Eco-friendly breweries across the U.S.